Emley is a rural village featuring a large Millennium Green with a viewpoint beacon. There is a stone cross at the centre of the village, two pubs, a post office, shop and village school. 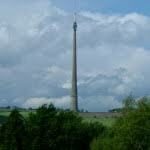 Nearby is Emley Moor Mast at a height of 330.4m (1,084 ft).